Arrowhead has won 11 consecutive Large Schools Division (enrollment over 1000 students) trophies, but after the fall sports season, it is Middleton who who leads the way. The Cardinals got a state title from the girls swimming/diving team along with runner-up finishes in girls tennis and boys cross country. In fact, Middleton scored at least 10 points in seven of the nine WIAA-sponsored fall sports, as their 345 points are tops amongst Large Schools and best overall. Big Eight rival Sun Prairie is second with 324 points, while Muskego, Kimberly, and Arrowhead round out the top five. Catholic Memorial is on top of the Medium Schools Division (enrollment 500-100), as the Crusaders claimed the trophy two years ago before finishing second last season. The football team captured a state championship, good for 100 points. Girls tennis finished as runners-up, while boys volleyball made it to the state semi-finals. Catholic Memorial scored 305 points overall, which leads McFarland's 285. The rest of the top five includes Notre Dame, East Troy, and Whitefish Bay. Edgewood has six Medium School trophies to its name, including last year, but the Crusaders enrollment has dropped below 500 and now places them in the Small Schools Division (enrollment below 500). Edgewood has a significant lead after fall sports, as their 335 points easily out-paces the next highest score of 240, shared by University School and Lake Country Lutheran. 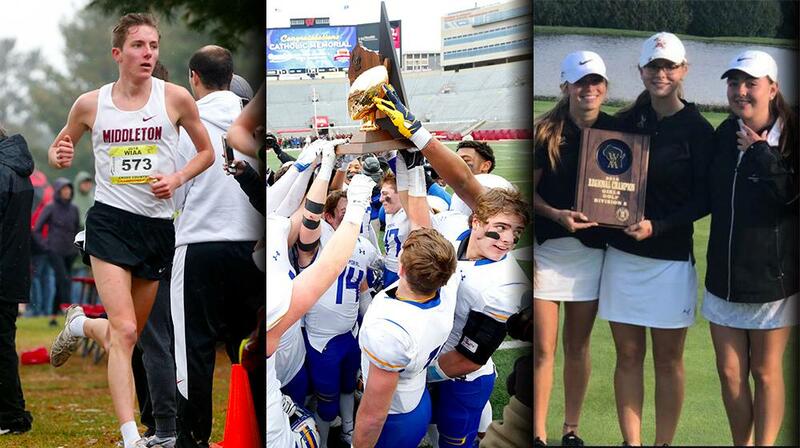 Edgewood got state titles from girls golf and girls swimming and diving, while the girls tennis team advanced to the state semi-finals. Amery is fourth in the Small School standings, while Lancaster and Aquinas are tied for fifth.